We are going to cover a much talked about subject, fading. This is the effect of the sun on real prototype paint which causes the color to change to a lighter shade or in some cases “pink out”. Soot and dirt will make some colors go much darker, in the case of the Burlington’s 1958 chinese red boxcars that look almost boxcar brown when viewed in the late 70’s. This I know because it’s the railroad I model and I have a color chip painted with the exact formula of Dupont ®paint. The cars I saw were in a scrap line at Chicago’s Metron Steel almost 30 years ago with my friend Dave Sarther and his son Davie. I couldn’t believe the overall change in its hue when we hiked up to their boxcar purgatory. I picked a sharp rock and scraped a patch on the side of the car and amazingly the familiar orangey-red color appeared. This type of fade would be simulated with a wipe of PanPastel® 740.3 Burnt Sienna Shade. Equipment painted in the transition era had a mostly lead composition and took quite a while to fade. 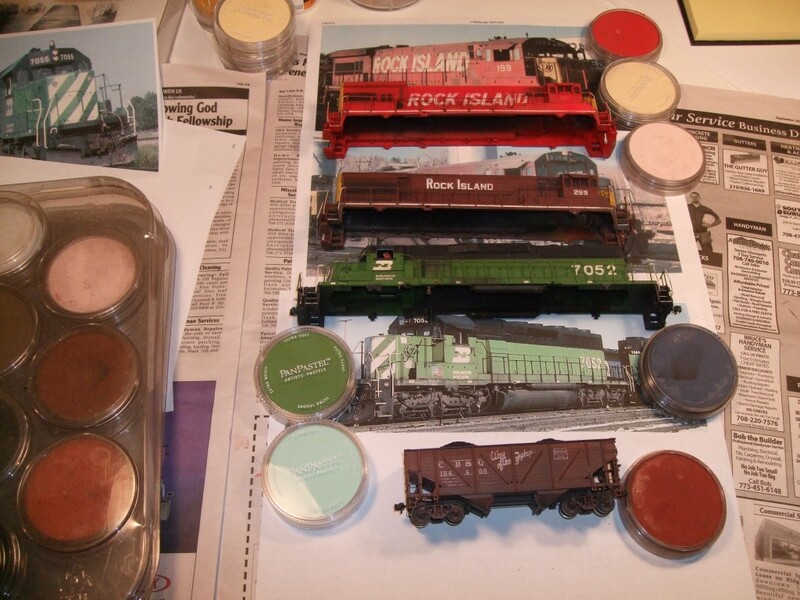 Locomotives and freight cars painted starting in the late 60’s were required to use a paint or coating using less or no lead. This gave us a different chemical change due to the elements. The colors were also much brighter and varied. Remember the 70’s? My Mom’s house had a fridge that was two-tone brown and around the corner, red and gold foil wall paper in the hall. Those brighter colors like Rock Island Material Service Red, Light (aka. Bankruptcy) Blue, Railbox Yellow, Conrail Blue and BN Green gave us a much wider palette to work with and they faded into some interesting pastel shades. Hey we’re working with PanPastel so this should be easy. Recently in the model world much of the available rolling stock is now pre-painted and built up. The manufacturers give us nice paint jobs most of the time but for purists there is room for correction. 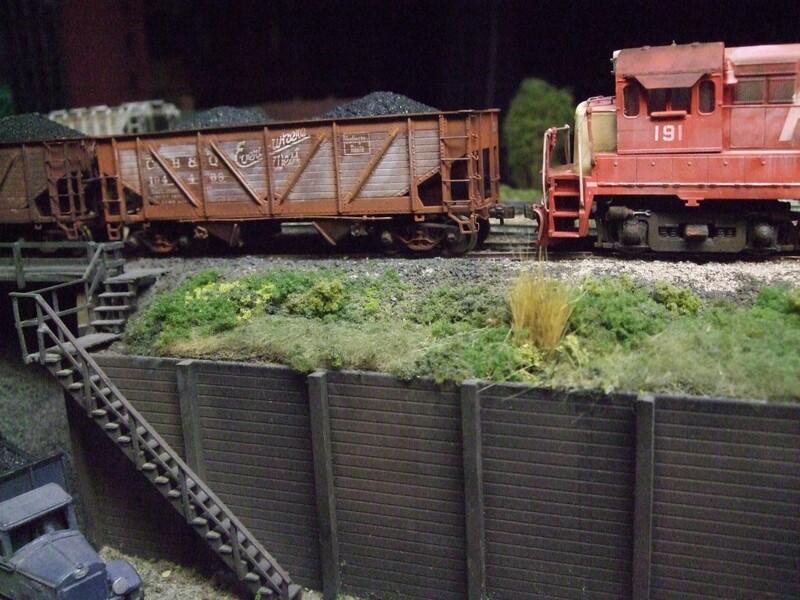 So for example, I have a group of Burlington open hoppers that are painted Boxcar Red. The actual cars were painted in Mineral Red which had a redder or more orangey tone. I was happy, at the time, to weather them with my airbrush and hope I didn’t notice. Years later with PanPastel in my life, I found 380.3 Red Iron Oxide Shade that looked much closer to the color I wanted. Unlike an airbrush, PanPastel with a small Sofft Tool can get right up to the white lettering without obscuring or covering it.